Infrastructure will be this year’s top legislative priority for Republicans, if President Donald Trump gets his way. Fresh off a major win on tax reform, the Builder-in-Chief is eager to work his dealmaking skills and have Republican leaders send him a $1 trillion, 10-year funding proposal to build and repair roads, bridges, tunnels, ports, airports, rail and other infrastructure. 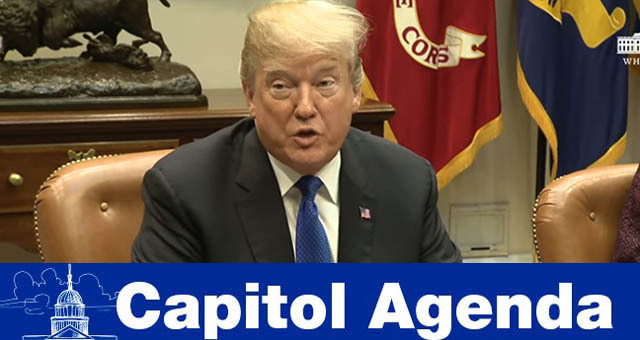 Stakeholders believing Trump will force the House and Senate to debate an infrastructure bill have been roaming the halls of Congress attempting to influence the upcoming funding debate. They are exhibiting a sense of urgency, noting the Highway Trust Fund’s looming insolvency (in about three years), and the possibility that many states will halt construction projects absent a reliable federal partner. Big-scale projects traditionally have benefited contractors, labor and businesses. Stakeholders agree the best, and quickest, way to inject funds into the transportation system (via the Highway Trust Fund) would be by raising federal fuel taxes. More than two dozen states recently have raised taxes on gas and diesel fuels to fund massive road repairs. Congress, meanwhile, has not moved the needle on fuel taxes since 1993. Several Democrats endorse the increase and are expected to push for one if infrastructure legislation is actually taken up in committee or on the chambers’ floors. With Rep. Paul Ryan (R-Wis.) as speaker, Republicans will not be having any of that. Voting on a tax increase is a no-no for lawmakers who signed Grover Norquist’s pledge. That leaves Republican leaders scrambling to identify alternatives to higher fuel taxes. And, thus far, they are opting to wait for the White House’s long-term funding plan, which could be unveiled any minute now. Expect to see proposals calling for a greater reliance on public-private partnerships coming from 1600 Pennsylvania Ave. P3s have many detractors. Freight haulers consider P3s that rely on tolls as double taxation arguing they already pay fuel taxes to maintain those roadways. Also, representatives from rural regions note their highways lack the requisite traffic volume to attract investors for toll projects. Tolling proponents disagree, claiming P3s are a fast approach for generating infrastructure dollars. White House infrastructure adviser D.J. Gribbin acknowledged the difficulties with navigating the funding waters while suggesting the White House has yet to dismiss calling for raising fuel taxes. Notwithstanding the tax reform feat, the 2018 calendar does not give Trump room for error. The midterms will sneak up on lawmakers. Political watchers are pessimistic about the Democrats’ willingness to work with Republicans on infrastructure and give Trump another legislative achievement to campaign on. Jan. 8-11: The 97th annual meeting of the Transportation Research Board in Washington. CLASS 8: North American Class 8 orders in December rolled past 37,000 and improved 75% year-over-year, ACT Research Co. reported. TOO HEAVY: While truck-to-truck communication, driver training and safety have advanced the effort to hasten platooning to market, another critical aspect is looming and just may cause momentum to pull back some: the impact on infrastructure. PAVEMENT: The Maine Department of Transportation is in the process of repaving major routes with better-quality pavement with help from a federal research partnership. Former Transportation Secretary Ray LaHood still dreams of bipartisanship in regards to infrastructure. About a week before President Trump’s State of the Union address, there likely will be a major event in downtown Washington on infrastructure funding, sources tell us. Not every project is suitable for a P3. Kennedy offers an analysis of the politics surrounding a massive infrastructure plan. Transport Topics’ Seth Clevenger comes across a T-Pod at the 2018 TRB conference.